The paint on your front door pretty much sets the tone for what people should expect when entering your home. You want your front door paint to be tasteful, but that doesn’t mean it has to be boring! If you’re looking for the perfect color, Modern Masters can make your dull front door look like a million bucks! 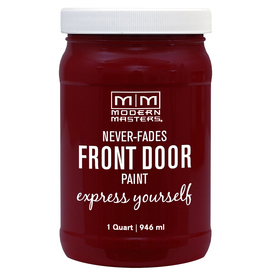 If you’re looking for the perfect color, Modern Masters can make your dull front door look like a million bucks! When deciding on what color to paint your front door, you just can’t focus on the door itself. You will also need to consider the siding, current color of your home and the color of the trim. Neon paint may be bold, but it won’t look great if you have a siding that is neutral color. While it’s important to express your personal taste and showcase your flair, you don’t want your front door to look like an eyesore. Some paints require you to use coat after coat to get the exact look you want, but with Modern Masters, 1 quart is all you need for 1 standard door. Painting with Modern Masters means your front door’s paint will never fade. In fact, most homeowners avoid painting their front doors because they think they will just need to use excessive coats to make it look good. Other homeowners are just afraid that they will pick the wrong color. Fortunately for Howard County residents, there’s a friendly staff in your area waiting to help you pick put the perfect color for your front door. Columbia Paint Company is your one-stop shop for all of your home-decorating needs in Howard County. From fabulous Hunter Douglass window treatments to beautiful Modern Masters paint products, we have everything you need to make your dream home design a reality. Schedule an appointment with our design consultant today!